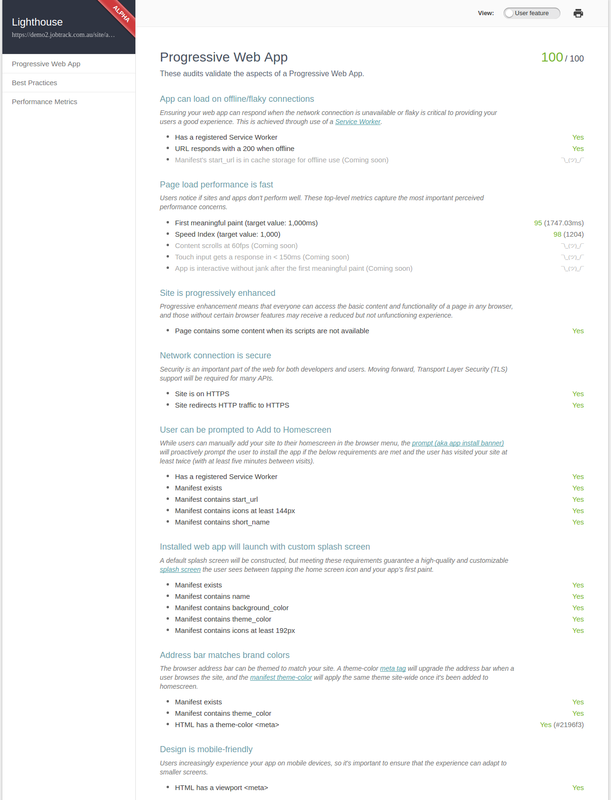 Does stSoftware&apos;s CMS allow consistent style sheet and link buttons across entire site? Does stSoftware&apos;s CMS enable documents and pages to be made unsearchable and unable to be accessed by visitors to the website? 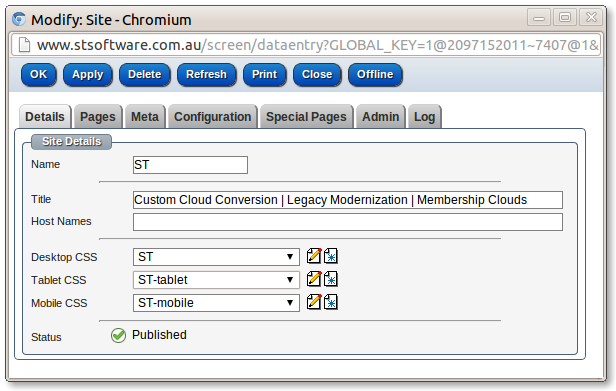 Does stSoftware&apos;s CMS allow for the management of Alt Tags, Heading Tags and Title Attribute Management? Does stSoftware&apos;s CMS allow for SEO friendly page and link designs? Does stSoftware&apos;s CMS allow HTML editing including a find and replace tool? Does stSoftware&apos;s CMS allow hyper link creation both to external and pages within the web site? 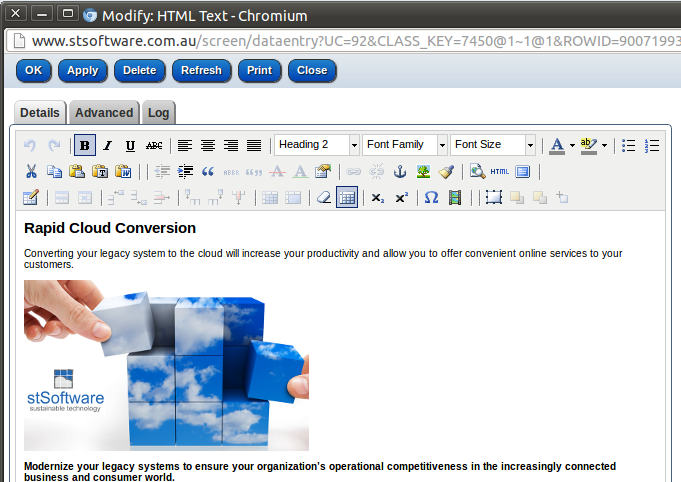 Does stSoftware&apos;s CMS allow for the creation of CMS managed e-newsletter campaigns? Does stSoftware&apos;s CMS include the ability to move pages within the navigation structure? 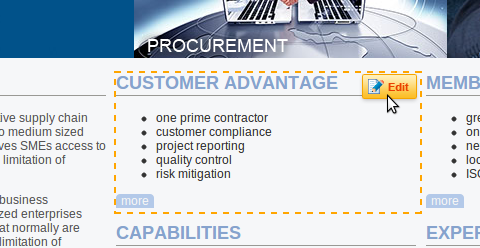 Does stSoftware&apos;s CMS include spell checking and word find? 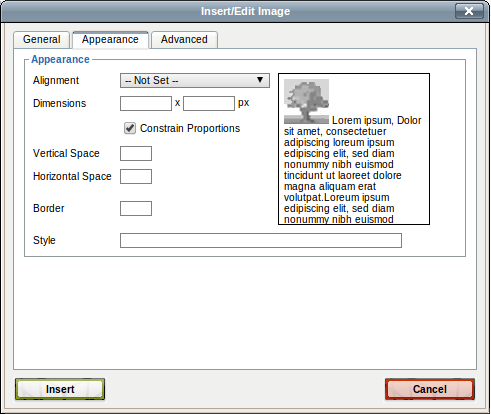 Does stSoftware&apos;s CMS include image resizing, compression, format conversion and placement tools? 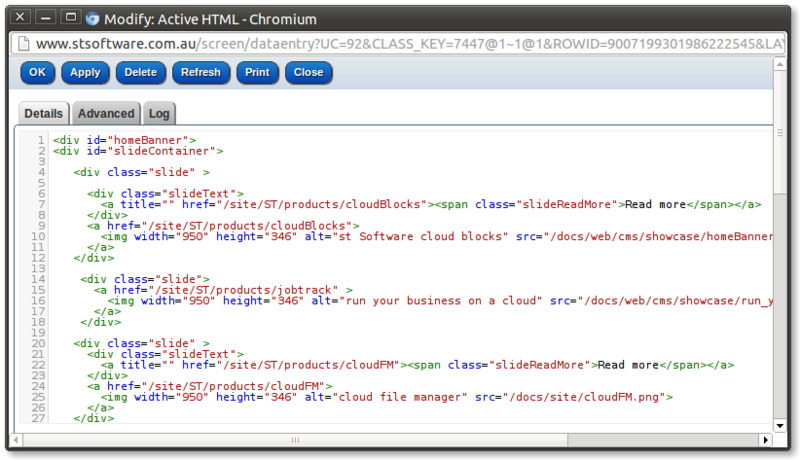 Does stSoftware&apos;s CMS include intuitive CMS authoring? 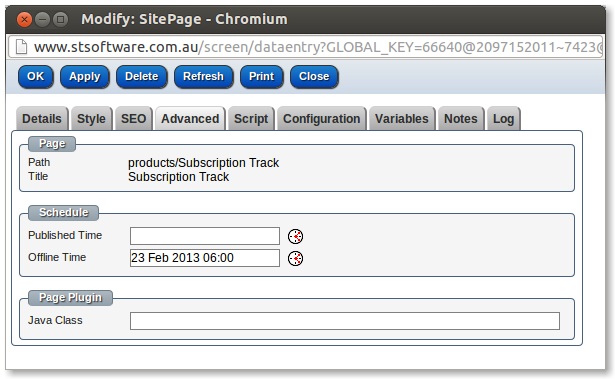 Does stSoftware&apos;s CMS allow the ability to set future publish dates and times? Does stSoftware&apos;s CMS allow for the creation and editing of event calendars? Does stSoftware&apos;s CMS allow for the creation of user- friendly URLs? 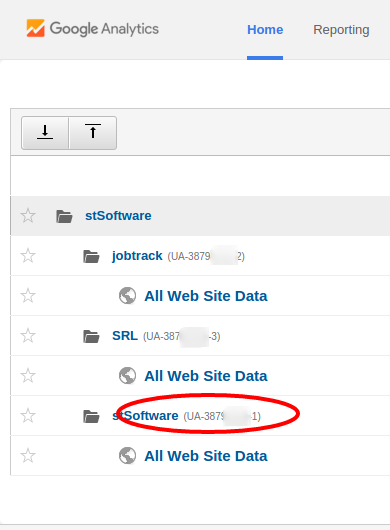 Does stSoftware&apos;s CMS include an audit trail and full version control of pages including roll-back ability? How to manage the site structure? Does stSoftware&apos;s CMS meet WCAG 2.0 standards? 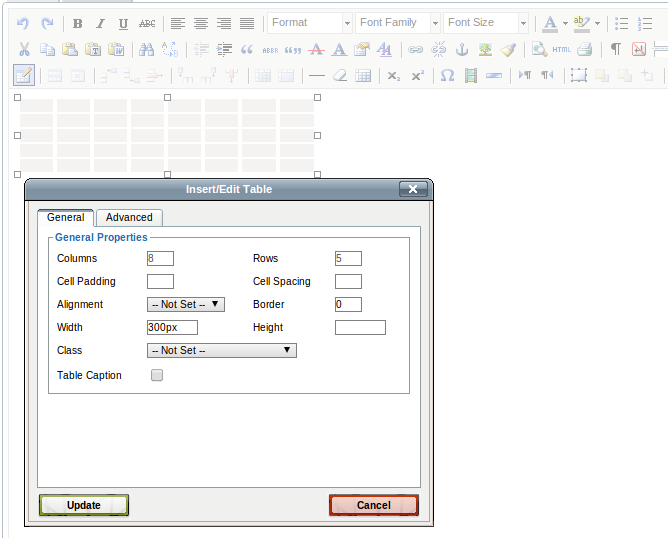 Does stSoftware&apos;s CMS editor include a full table features and editing tools? Does stSoftware&apos;s CMS allow the content of structured pages and e-newsletter to be copied to create a new structured page or e-newsletter. 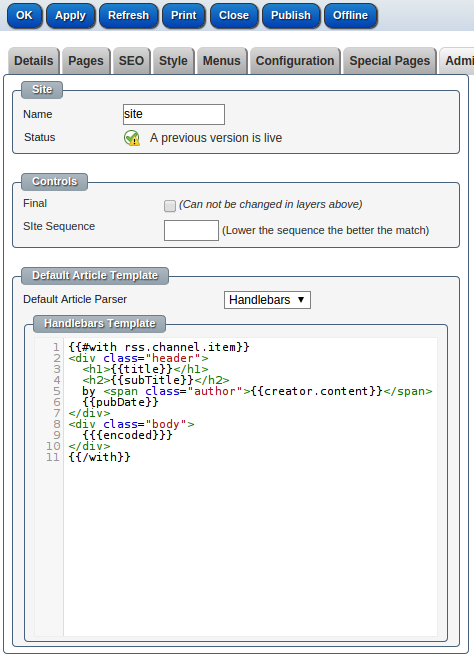 Does stSoftware&apos;s CMS include an intuitive structured page builder to create fields for repeated content? 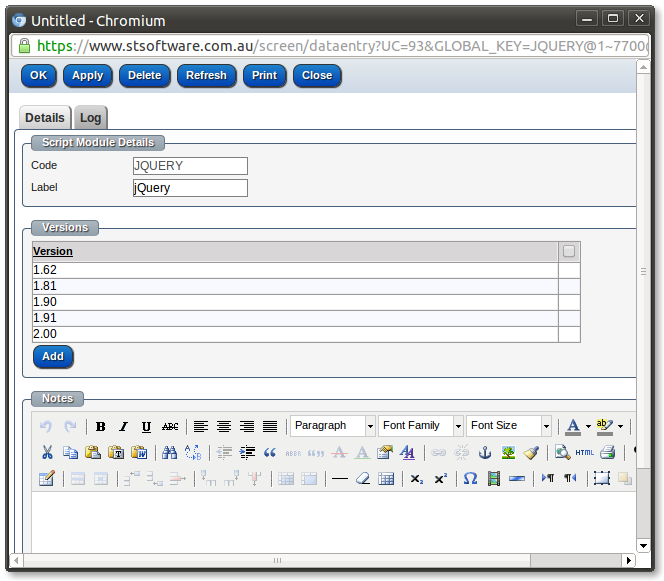 Does stSoftware&apos;s CMS editor include bullet and number lists? 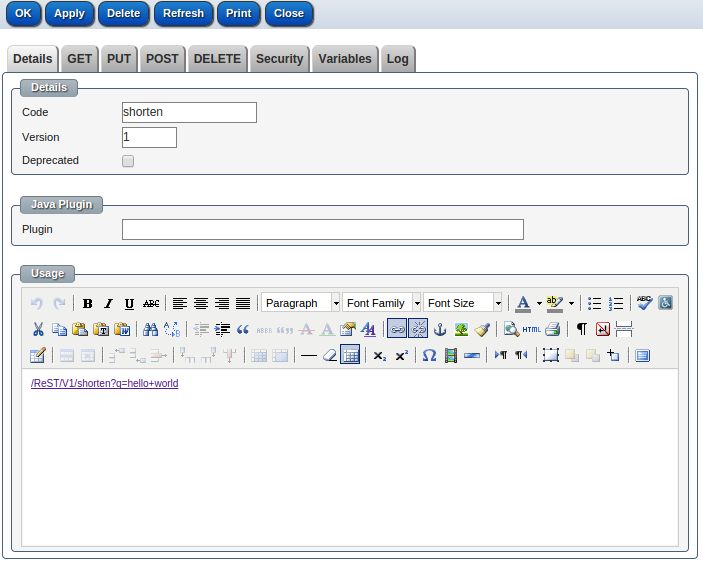 Does stSoftware&apos;s CMS editor include anchoring features? Does site builder and stSoftware&apos;s CMS allow pages and images to be assigned metadata? Are there multiple page status&apos; to manage webpage development through to publishing? Does stSoftware&apos;s CMS allow inclusion of widget scripts such as social media feeds, survey monkey feeds, youtube/vimeo video feeds and Google/Apple map placement? Is stSoftware&apos;s CMS responsive Design catering to both desktop and mobile screen sizing? Does stSoftware&apos;s CMS provide accurate draft page previewing features? Does stSoftware&apos;s CMS include page level restrictions allowing authors to publish select pages only? 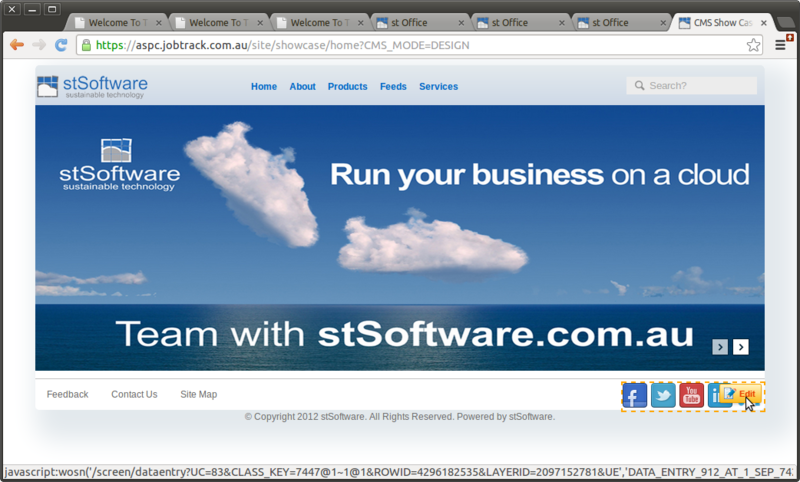 Does stSoftware&apos;s CMS automatically advise of broken links and page errors? Does stSoftware&apos;s site builder allow for the creation and management of micro-sites using the same CMS? 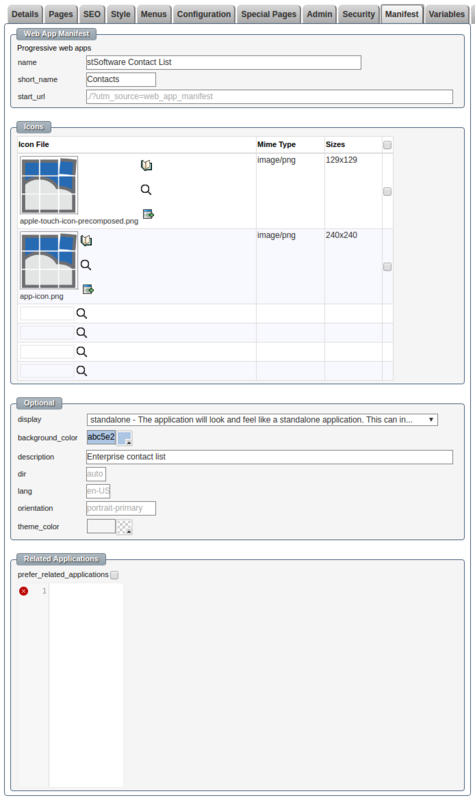 Does stSoftware&apos;s site builder allow the use of frames? How do you retrieve data out of the database? Does the site builder allow for pages to be viewed within the same screen or in a new window/tab? Does the CMS include a script manager? Does the mobile platform allow for the completion of forms/online applications? Does stSoftware&apos;s CMS allow for mobile social media feeds? Does the mobile design allow for easy navigation and task completion? 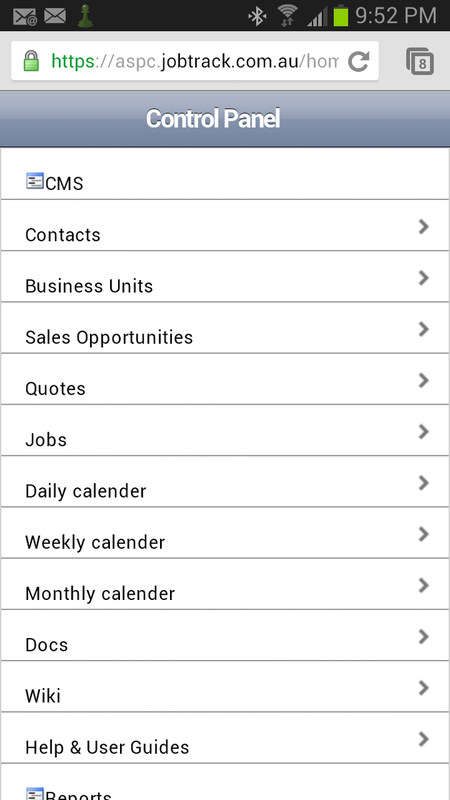 Does stSoftware&apos;s CMS site builder allow selection of any page and translate it for publication to a mobile website? How is the PWA manifest generated? Does renaming a page&apos;s path automatically redirect from the old page path? Does stSoftware&apos;s CMS include Form Creation tools? 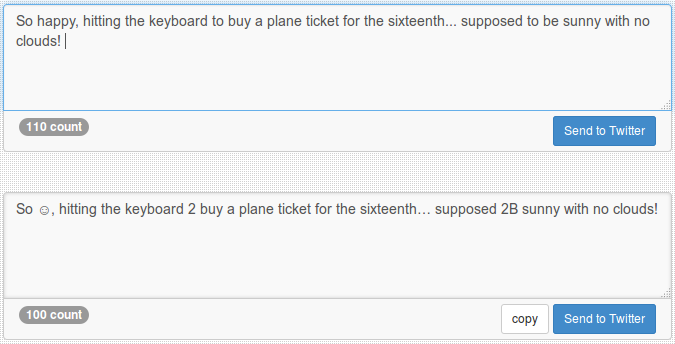 Ability to use custom post types and custom fields. Does Cloud CMS include a powerful search engine with the ability to prioritise results? Does stSoftware&apos;s CMS include draft content pages and notification system (email alerts) to administrators including mark up of changes made? 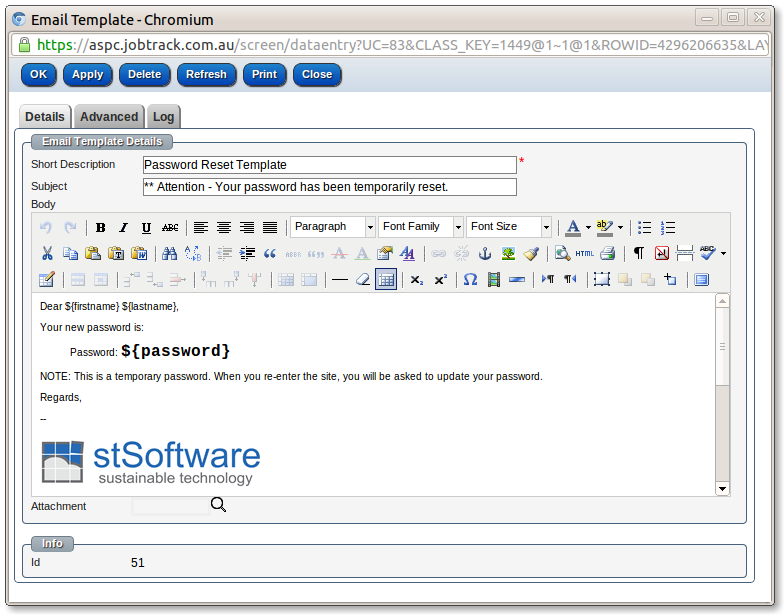 Does stSoftware&apos;s CMS allow unlimited number of administrators each with their own unique username and password and access privileges. 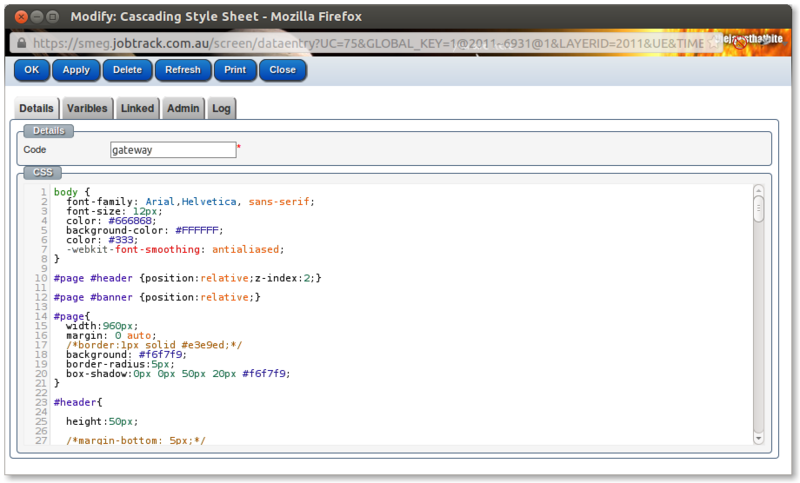 Style sheets can be specified at the site or page level and based on the browser filter. Only published articles, pages and sites can be viewed by visitors. Image title, image description and advanced editing are entered with the Insert/Edit Image tool. The CMS automatically handles SEO requirements such as sitemaps and permanent redirects when a page is renamed. The standard article editor includes find/replace option.We use TinyMCE for the editor, any of the TinyMCE buttons can be enabled. The CMS menu items can link to site pages and external pages. The menu item page links are automatically updated when the page URL changes. The menu items for external URLs are not automatically changed. 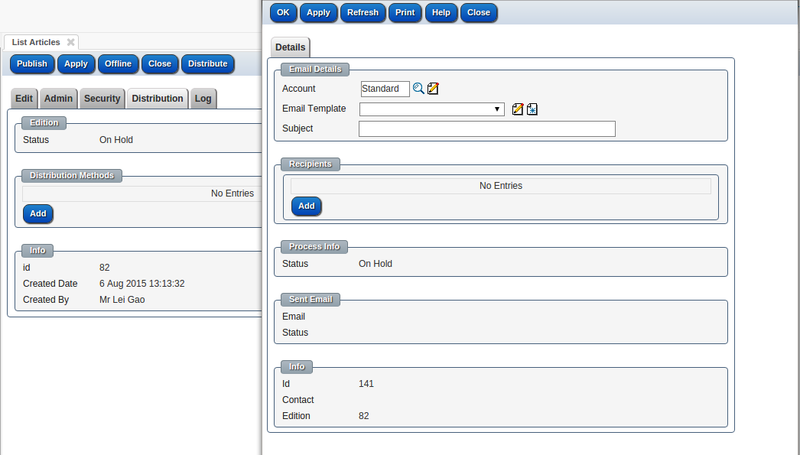 Standard email templates and contact management with build templates, import/export and subscribe/unsubscribe functionality. 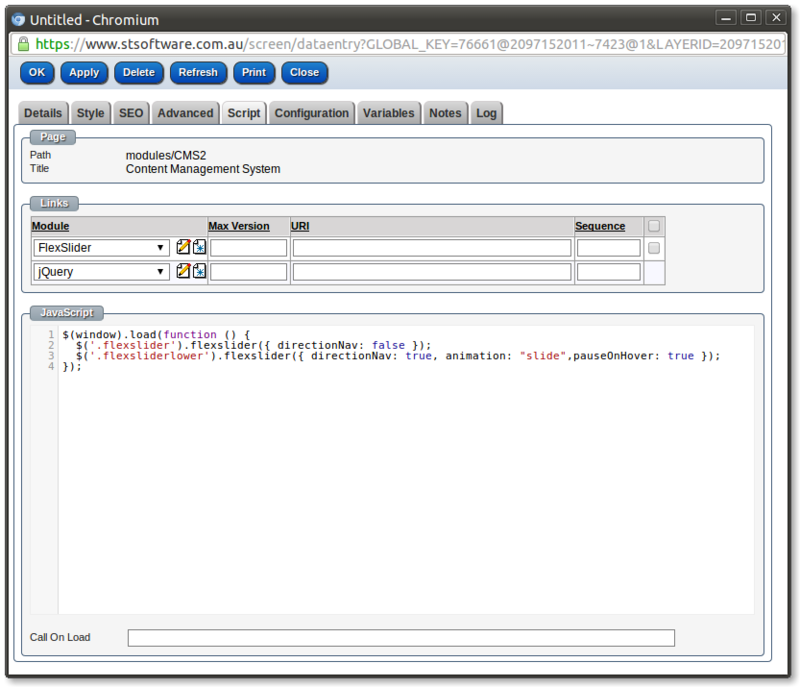 The system has a central Contact Relationship Management (CRM) module. The standard features include bulk emailing and email templates. Email templates with "mail merge" substitutions is a standard feature. All reports can be exported. New contacts can be entered. 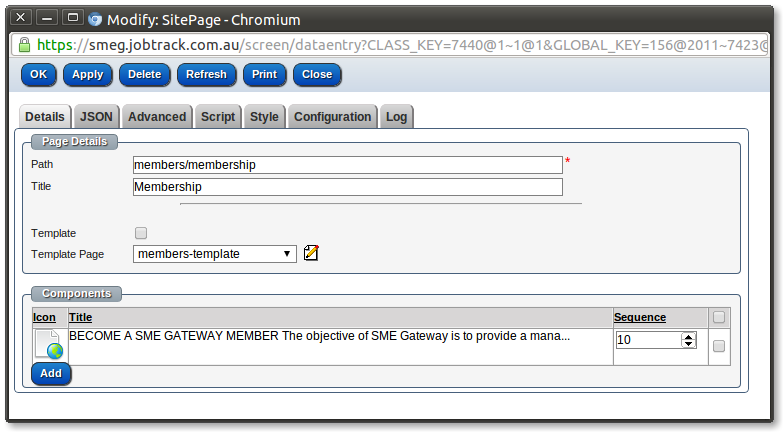 Sections of the standard forms can be hidden as required or new forms can be created. 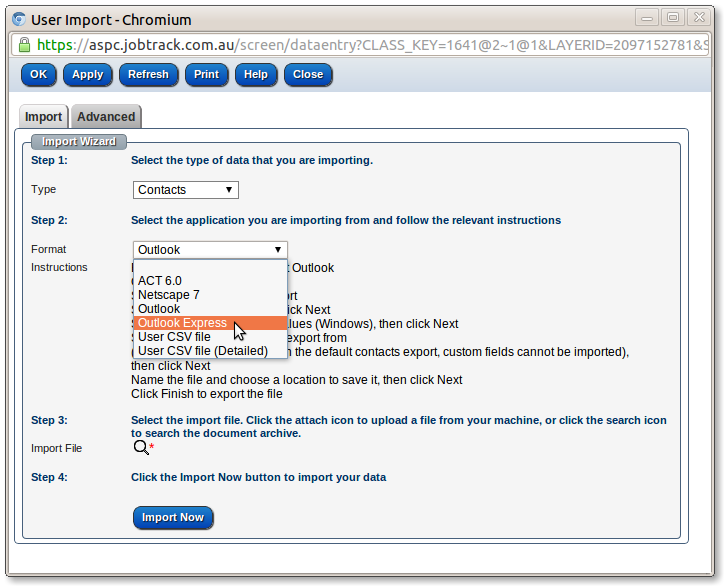 Easily import contacts using the import wizard, which includes a number of predefined templates. Custom layout can also be used. All menu items can be easily re-ordered. Pages and menu items are easily re-ordered, by changing the items sequence number. 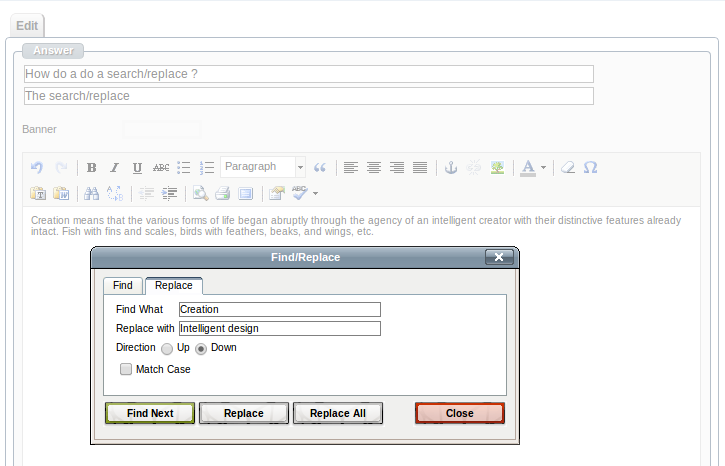 The standard article editor includes find/replace and search options. 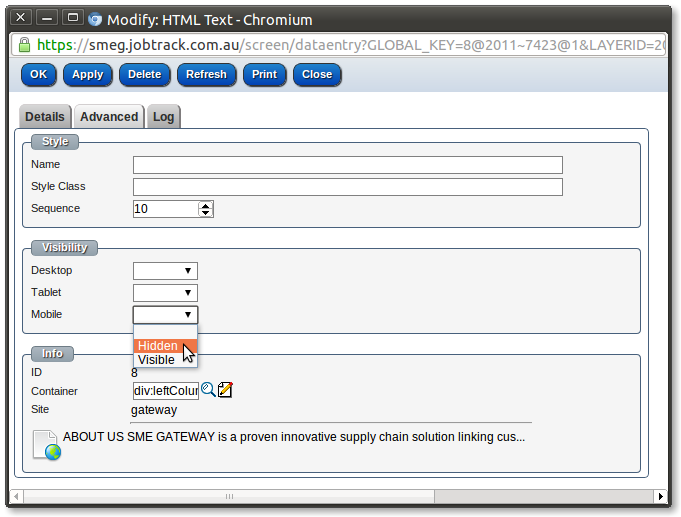 We use TinyMCE for the editor, any of the TinyMCE buttons can be enabled. Images handling in articles and pages can be re-sized, compressed, placed and styled as required. 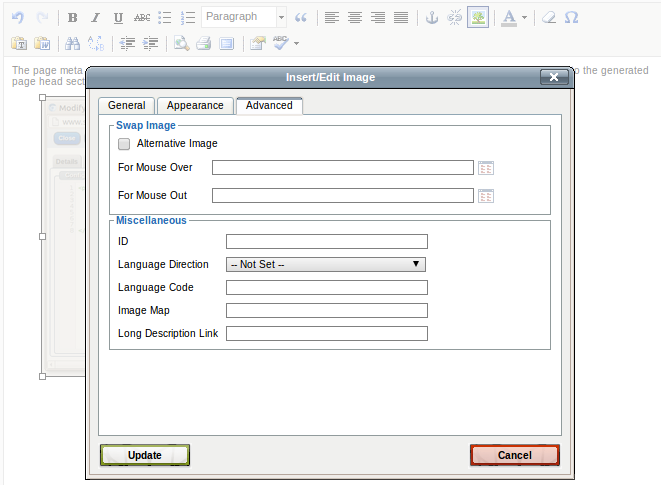 Images can be resized and style set from the page authoring user interface. All images can be compressed on the server side (reducing the size of the image downloaded to the client) by using the standard FORMAT URL parameter. The image will be converted on the server side and cached for performance reasons. 1) When authoring a new article the user selects the type of article (specific article types can be customized as required). 2) Edit the newly created article. Publish at a future time by setting the required time. By setting a future date as the published time the article will not be published until that time. Events are a standard component of the system. The standard components for task and events can be used or any number of external events management components. Article titles are automatically converted to friendly URLs. The web safe characters of the article title are used to automatically create a friendly URL. Unicode characters and non-web safe characters are converted to "look alike" web safe characters. Site designers may enter friendly URLs for their pages. 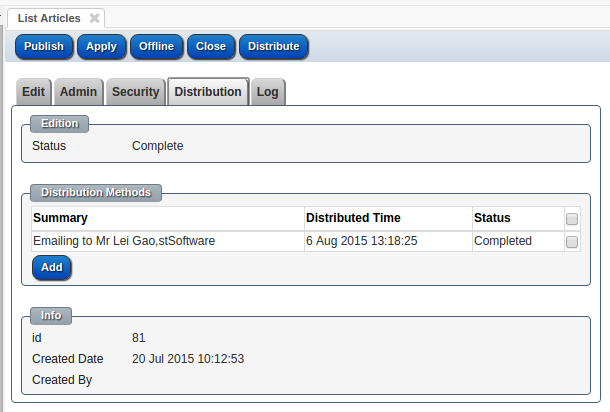 A full audit trail is automatically recorded for every change in the system. Selecting records as they were at any point of time is standard functionality. On each standard screen there is a log tab which shows the changes to this and related records. 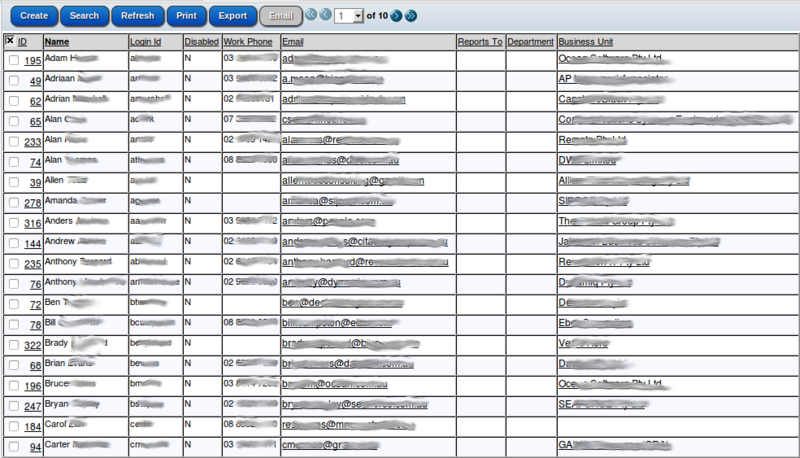 Each transaction record every change to every record within that transaction. The journal can be searched using a number of very suffocated commands. Any transaction or set of transaction can be reversed by an administrator. Below is an example of using variables in an ActiveHTML component. This variable uses xpath statement to fetch values from the site configuration xml. 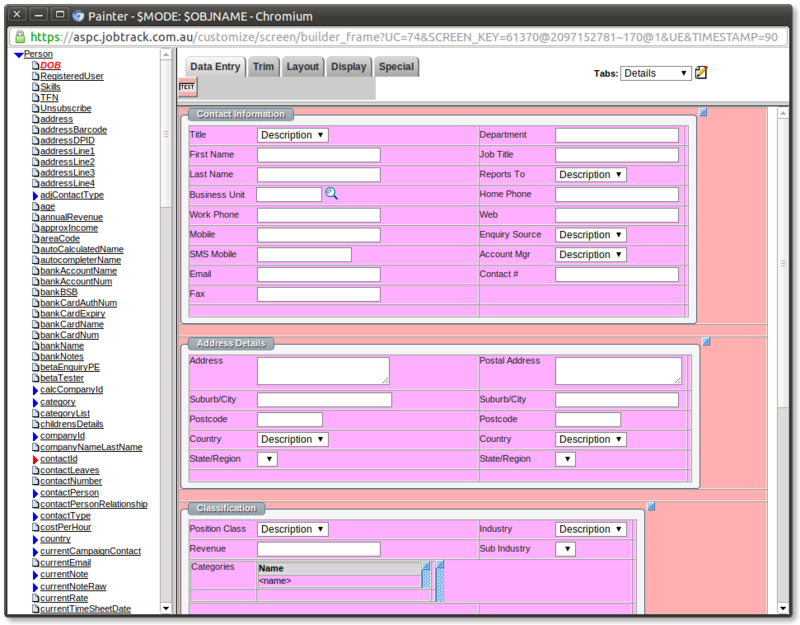 Below is an example of site configuration XML that should be used for site scope. This variable uses xpath statement to fetch values from the page configuration XML. 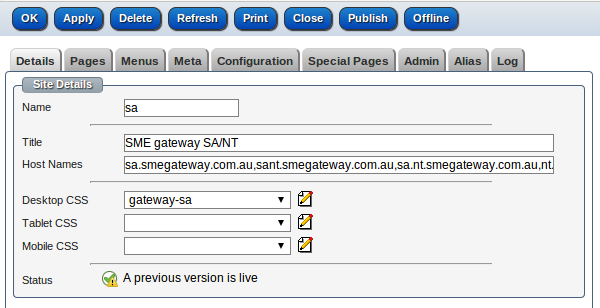 It looks and behaves similar to 'Site Config XPath Variable' except that the XML configuration has a page scope. This variable uses SQL statement to fetch data from the database. Below is an example of fetching the company name from the database. To make a site the default for a domain or set of domain names a comma separated list of host name patterns is entered. The default site is calculated to be the first PUBLISHED site with a matching host name pattern, if no matching sites then the first site will a blank host name list. All pages and menus are managed on the site screen. Each site has a series of pages and menus. A page can be taken offline or scheduled to be taken on/off line at a certain time. The menu and site maps will automatically adjust accordingly. Representational State Transfer (ReST) has gained widespread acceptance across the Web as a simpler alternative to SOAP- and Web Services Description Language (WSDL)-based Web services. The resources are acted upon by using a set of simple, well-defined operations. The REST architectural style constrains an architecture to a client/server architecture and is designed to use a stateless communication protocol, using HTTP/HTTPS. 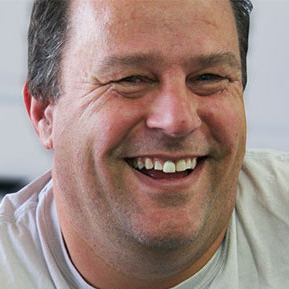 The system allows a series of RESTful services to be defined. The ReST service will normally return a JSON object when successful. Other formats can be requested by the "accept" header. 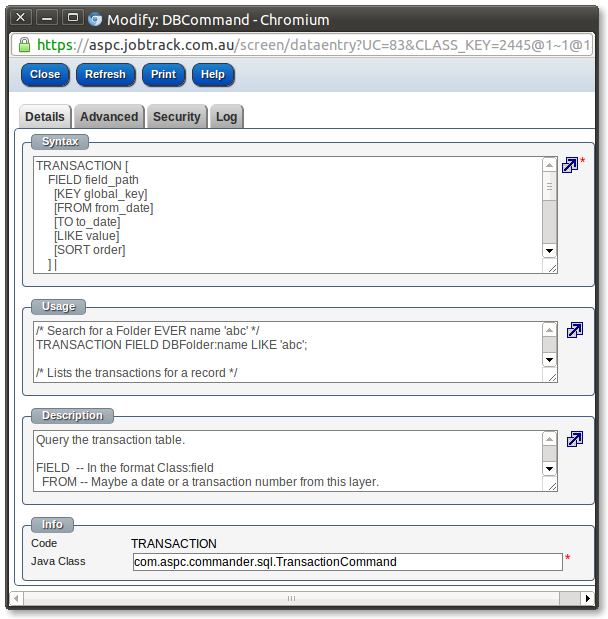 Client/Server, Stateless, Uniform Interface etc. "... more what you'd call 'guidelines' than actual rules" ~ Captain Barbossa. Different actions are defined for each of the HTTP methods GET,DELETE,POST,PUT. Since some browsers do not support sending PUT and DELETE requests there is a simple work around for this limitation by including a _method parameter in the query string or parameters of an HTTP request. HTTP has provisions for several mechanisms for "content negotiation" - the process of selecting the best representation for a given response when there are multiple representations available. — RFC 2616, Fielding et al. Content negotiation is the process of selecting one of multiple possible representations to return to a client, based on client or server preferences. The returned results will be in JSON format. The results will be returned in XML format for ReST services that don't natively return PDF. The _accept parameter will override the Accept HTTP header. 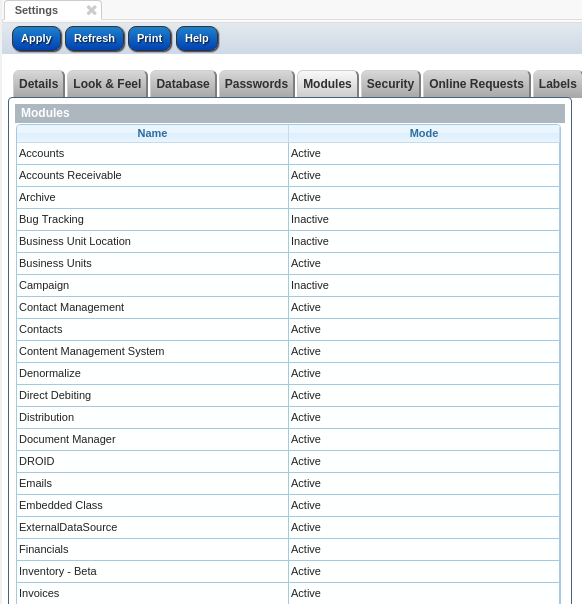 ReST services without any permissions defined can be called by any user whether logged in or not. If any permissions are defined for a service and the client call is not logged in a 401 ( unauthorized ) will be returned. If the client is logged in but without sufficient permission to run the ReST service 403 ( Forbidden ) will be returned. 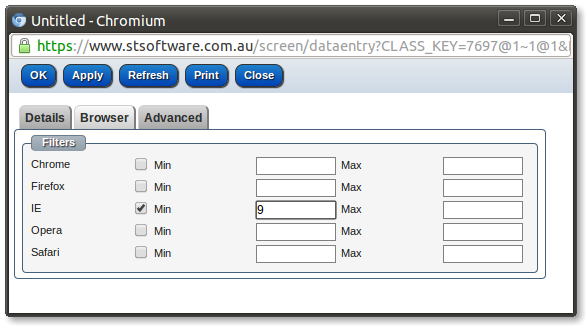 Magic numbers gives access to this ReST service based on a special unique random key. The “magic number” can be limited to a period or number of calls. 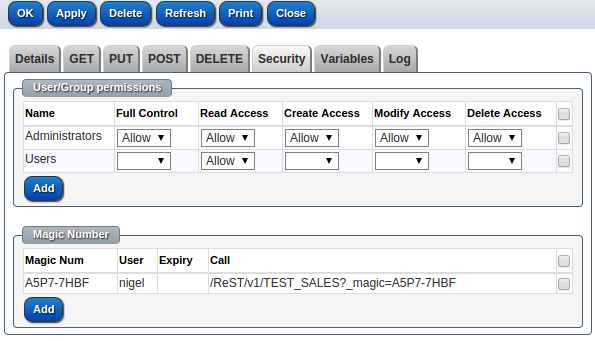 The properties of a “magic number” override any parameters in the ReST service call. A Java plug-in can be defined to override the default behaviour of the system. The stSoftware API attempts to return appropriate HTTP status codes for every request. Not Modified There was no new data to return. Bad Request The request was invalid or cannot be otherwise served. An accompanying error message will explain further. In API v1.1, requests without authentication are considered invalid and will yield this response. Unauthorized Authentication credentials were missing or incorrect. For a ReST definition which requires a login. Forbidden The request is understood, but it has been refused or access is not allowed. An accompanying error message will explain why. Not Found The URI requested is invalid or the resource requested, such as a user, does not exists. Also returned when the requested format is not supported by the requested method. Internal Server Error Something is broken. 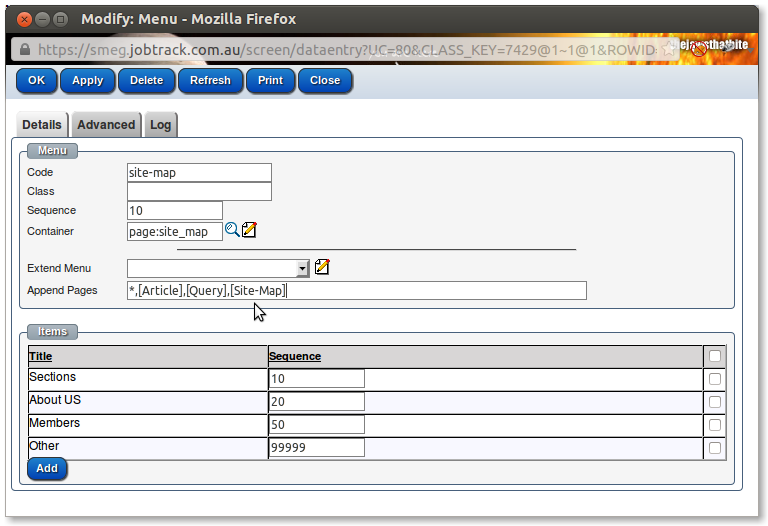 Each CMS site could have one default article template, you can set it in the Admin tab of the site data entry screen. 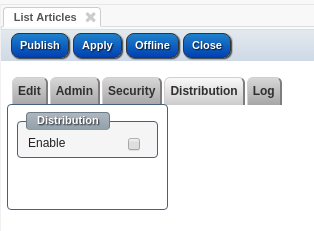 Once Distribution for this article is enabled, you can add Distribution Methods. 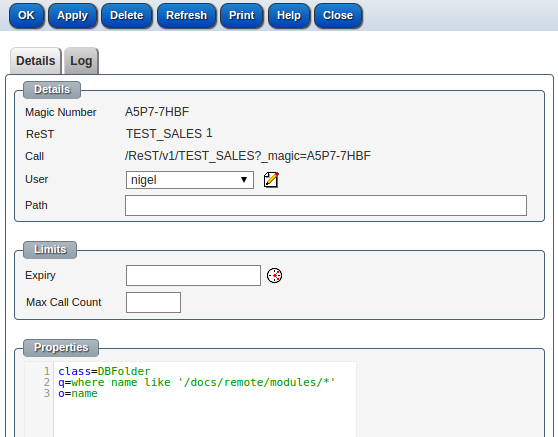 You don't have to select Email Template or enter Subject, the default template will be entered once the method is saved. But make sure the Account is entered, and enter the recipients. 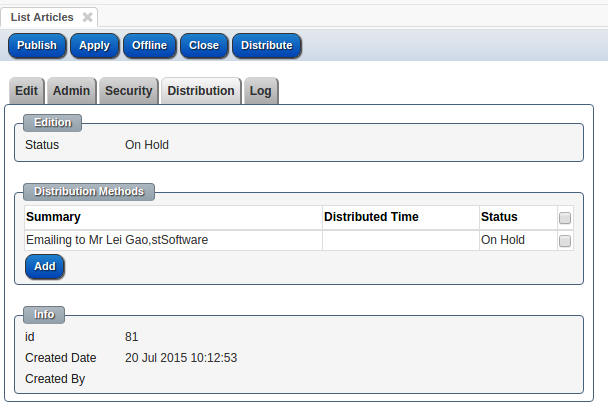 Once the Distribution Method is entered, the status is On Hold. Now, you can click the "Distribute" button on top of the page to put this article into the job queue, the email will be sent soon. 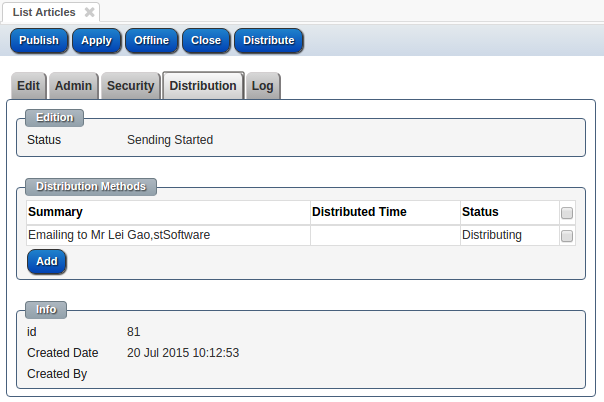 The edition status is changed to "Sending Started" and method status is "Distributing". Refresh the screen, the status is changed to Completed, that means the email was sent. If there's any error when sending the email, the status will be changed to Error. Finished! You have distributed your article to a list of email recipients. Accessibility checks are built right into the WYSIWYG text editors and validation messages are given when known issues are detected in the site. Our custom sites comply with WCAG 2.0 AAA. There is no need for alternative "accessible" versions of the custom sites as we do not use or recommend the use of unfriendly technologies such as flash or Java applets. When a HTML component is changed validations for the validity and for accessibility will be performed. Content can be copied/pasted as normal, in addition content can be extended and reused. Content can be pasted in paste, "paste as plain text" and "paste from word"
All articles are published via an enhanced RSS feed. The content of these articles is then reused in multiple locations using XLST throughout the site. The site designer can create template pages and then extend these pages to reuse the template page content. The system has Articles which can be written by users and Sites created by a web designer. 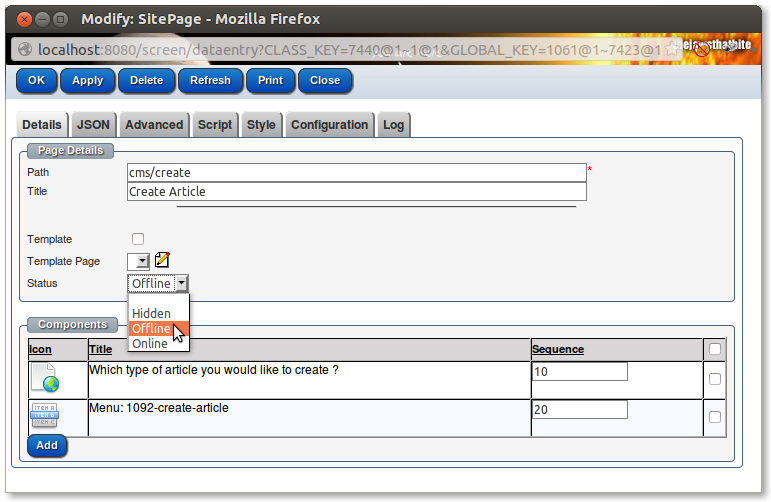 The user can choose which type of article they would like to create, the article form contains the required fields. 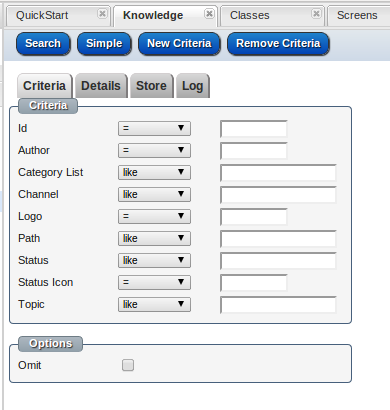 Additional article types and fields may be added to match your requirements. The simple user interface allows you to organise all types of content, including text such as manuals, photos and videos into pre-designed Articles. 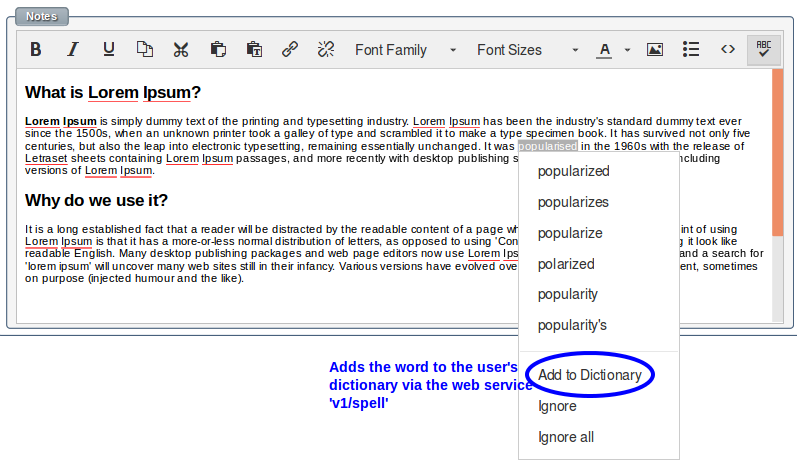 Your content contributors can quickly edit existing content or upload new articles, and preview. New content can be set for publishing at a later date or publish immediately. The Site designer (which designs the website where your published articles appear) is much more complex to enable the creation of sites without limitations. 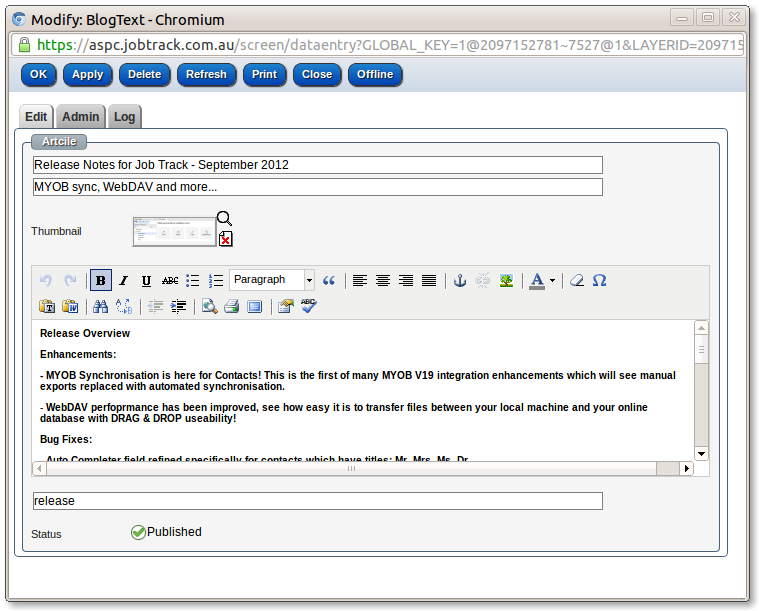 The CMS interface includes Insert/Remove Bulleted List and Insert/Remove Numbered List buttons for HTML text editing. 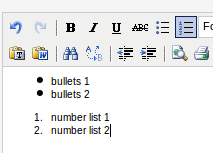 Insert/Remove bullet List and Insert/Remove Numbered List buttons are available in the HTML text editor. 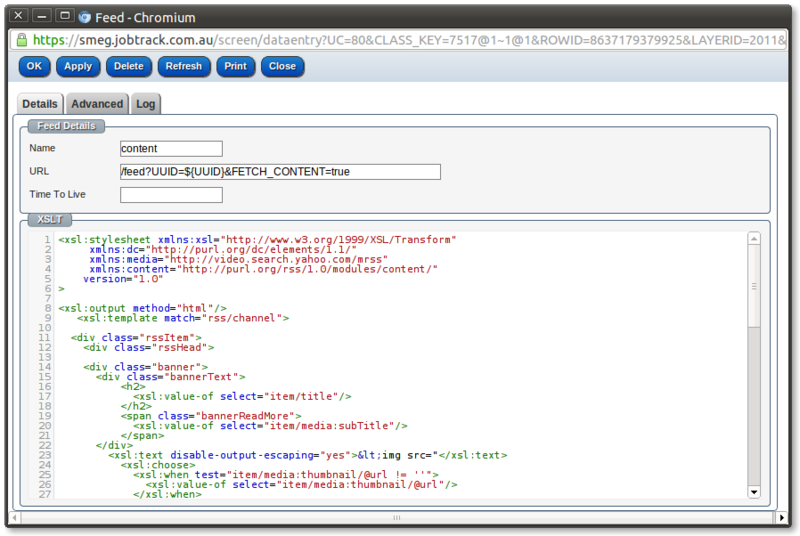 The HTML text editor includes an Anchor button to create anchors. The Anchor button can insert and edit anchors. Article titled with non URL friendly characters will be automatically translated to a friendly path when published. All requests for data or modification to data goes via the DAL ( Data Access Layer) no matter which protocol is used. There is NO direct access to the underlying data store. The DAL checks the ACLs ( Access Control Limits ) for each data request and performs all validations on each data modification. 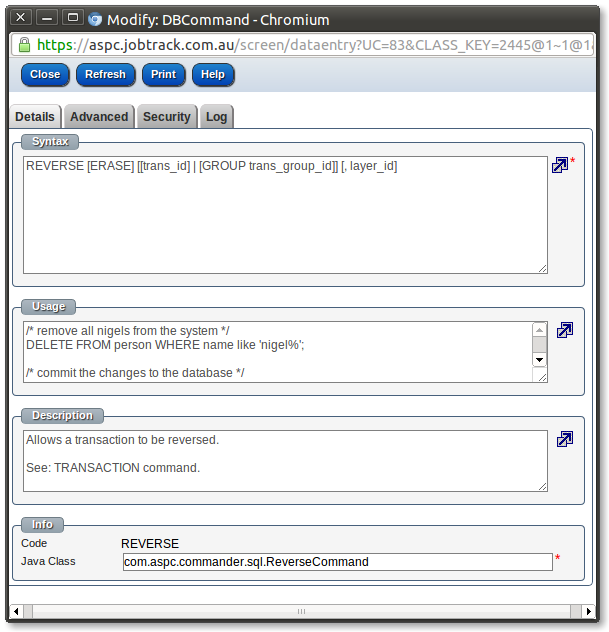 When data is modified the DAL will broadcast a message to other servers in the cluster so that optimistic locking and caching can be done within the server cluster. There is over 100 standard commands that can be called via the predefined web services. The full list of commands that can be called via SOAP or ReST can be found here. 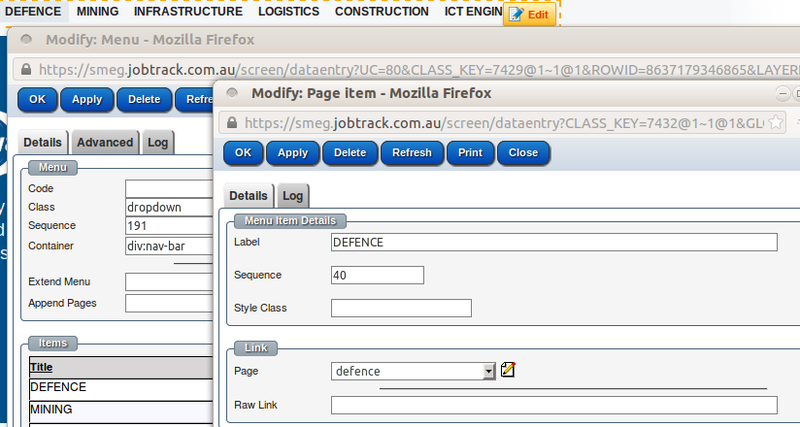 The page meta data can be set in the configuration tab for each page. 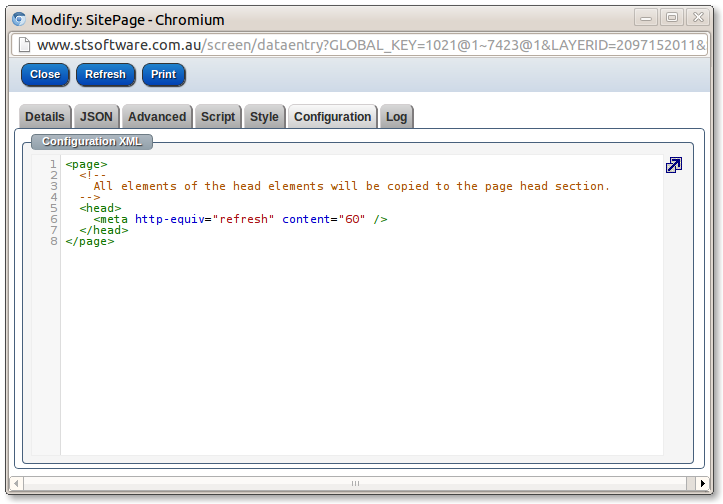 All elements in the "head" element will be copied to the generated page head section. 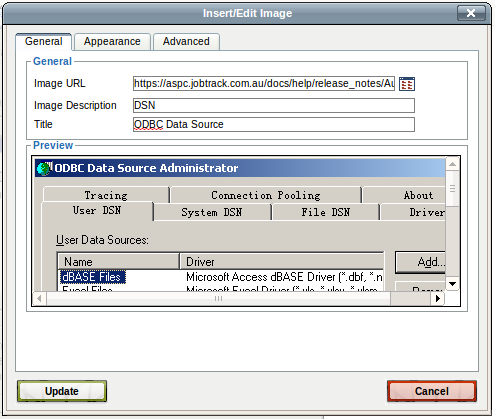 The image meta data can be set in the "Appearance" and "Advanced" tabs of the image editor. The CMS Site builder has multiple page status' to enable you to control the publishing of webpages while they are being developed or changed. The CMS Site builder has multiple page statuses to enable you to control the publishing of webpages while they are being developed or changed. Page status is easy to use and gives website developers very effective control of the publishing process across the site. You can utilise different page status to manage the publishing of individual pages. For example by setting the status of a page which is under development, to 'Offline', this page will not be published (not visible on your public site) when you next publish your website. There are four main page status; Offline, Published, Published Scheduled, Offline Scheduled. There are two modifiers; "locked" and "dirty". 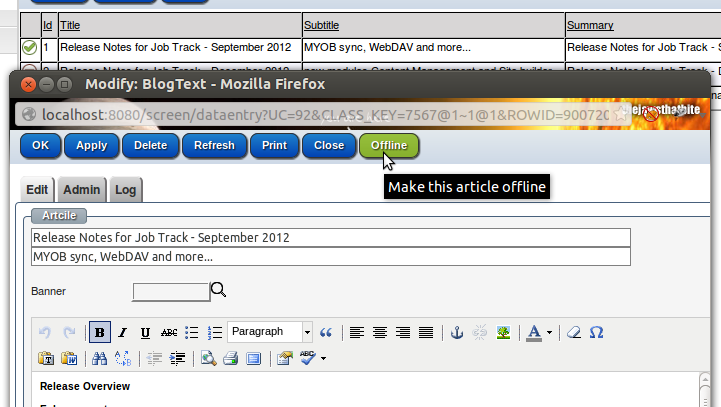 Offline: means a page can be held back from being published when you publish your website. The offline status is very useful while you are developing new pages or are in the process of updating a page as it means you can stop those unfinished pages from being published but it allows you to go ahead and publish the site. Published: means your page has been published and is viewable online to the public. Publish Scheduled: means your page has been approved for publishing and will be published with your site at a future publishing date/time. "locked": means no page component may be changed. You can still make changes to a number of page attributes like path and online/offline. To change a component of a "locked" page you clone it and make your changes. "dirty": means there have been changes to your page since the site was last published. This indicates to the developer/publisher that the page should be reviewed before the site is next published. A "dirty" page should be reviewed to see if it is ready to be published or set to Offline so it is not published until it is 'ready'. The publishing work flow of Articles can be customised to your requirements including permission to publish based on user group. 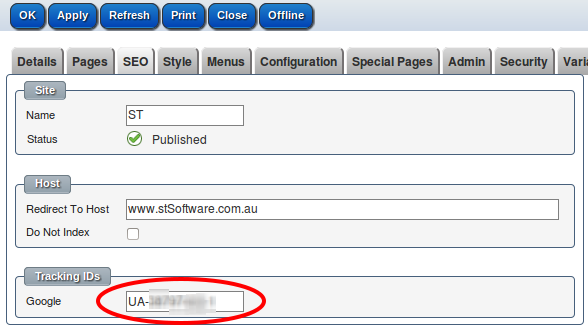 Standard publishing controls allow for immediate publishing or set by future date. When in CMS design mode, when the designer mouses over a component an EDIT button is shown for 5 seconds. A orange dotted line will outline the component that will be edited. Any script or HTML component can be added. The system automatically detects a desktop, tablet or mobile. The system will detect the different form factors and apply different Cascading Style Sheets accordingly. Each component in the site can be hidden or shown based on the browser's form factor. 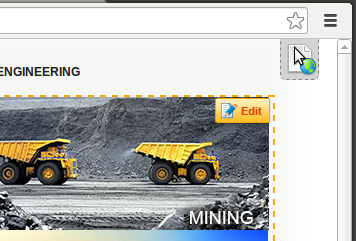 Site Page authoring has a full preview with temporary edit button on mouse over of a component. When designing a page (which is different to a user authoring an article) an edit button for each component appears as the designer mouses over the component. Articles and pages can be published or taken offline selectively. Articles can be published, publish scheduled or offline. Validation is performed on each save of a component. On each save of a component validation is performed. Menu links to pages are always synchronized. Any number of micro sites can be created with the system. The simplest way to create a new site is to clone an existing site. 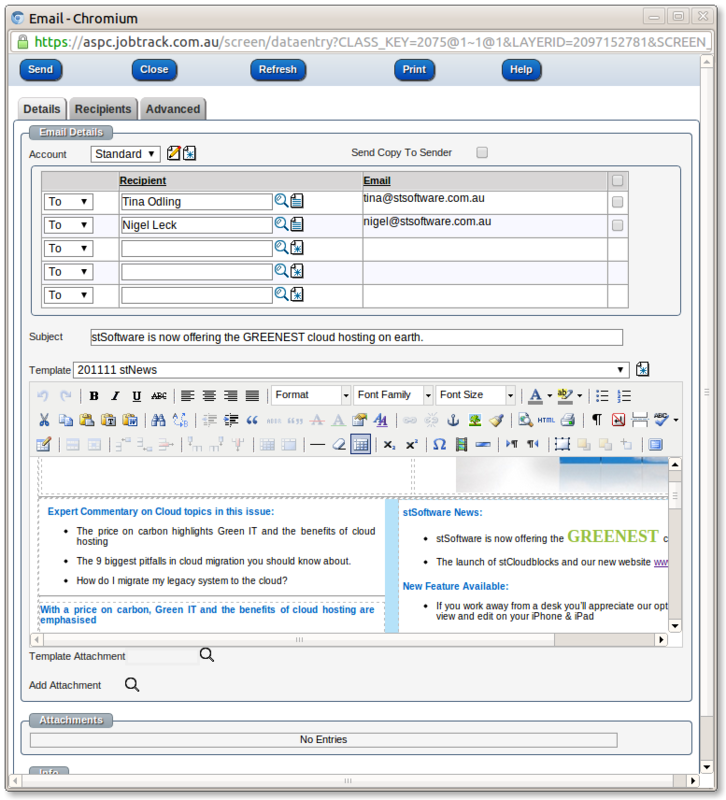 A site can be created for a specific host name or for "intranet only". 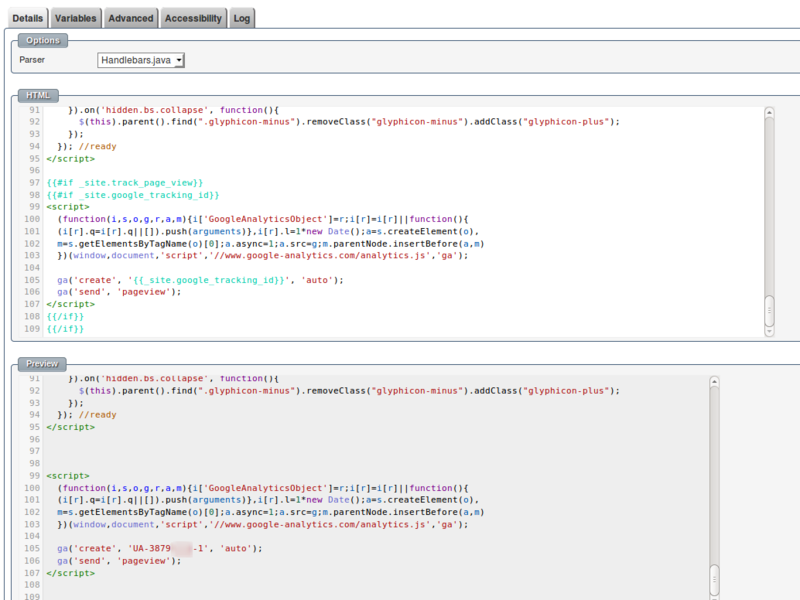 JQuery and JSON will be used to fetch the data out of the database. 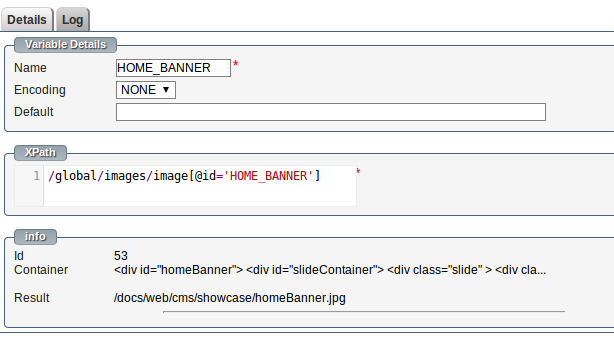 The standard JSON component will return the images for the banner. Pages can be viewed in any logged in browser window. The design mode of the CMS is the standard page/URL with an additional parameter DESIGN_MODE. The system checks if the user has CMS access and then will show the site in design mode. yes, the site owner can/should be able to change anything. An example is SRL when they publish an article the banner image is placed on the carousel and linked to the article. The page reads this information from the RSS feed. Many versions of a script libraries can be stored in the manager and the best matching version is returned. Every page can define a script and/or include a number of script modules. Each script version can specify what is the maximum and/or minimum browser version compatible with this script. The page can specify the a maximum version number for inclusion or just the script module. 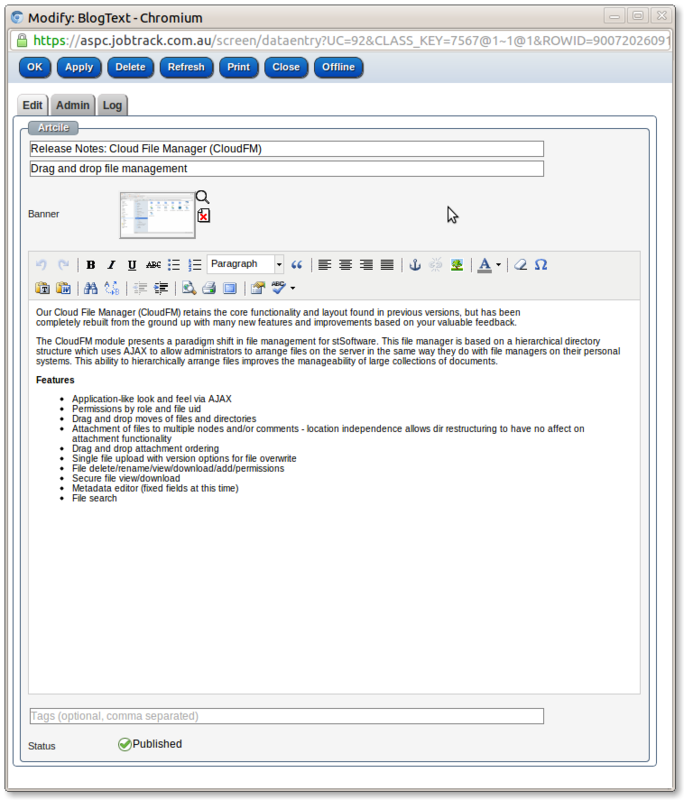 The script manager will include the highest compatible script version. Forms and online applications can be completed on mobile devices. Mobile platforms (mac and android) are compatible with system forms and online applications and integrated to automatically process the data into system work flows. 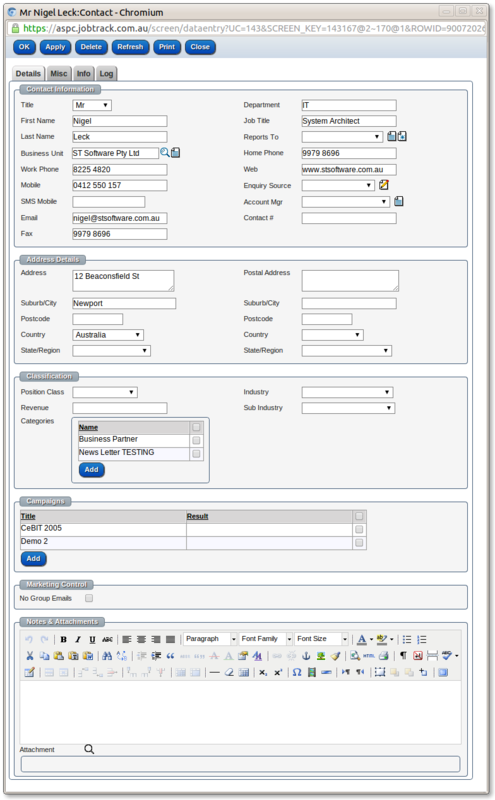 Here is a form on an iPhone, this example shows the ability to have forms which have a further action (apply and also create a free online trial of software). The CMS allows for social media feeds on mobile platforms (mac and android). Social media feeds are seen here on on iPhone in the footer. Mobile control panel navigation is quite different to desktop. Every page and component with a page can be hidden or shown based on the form factor. 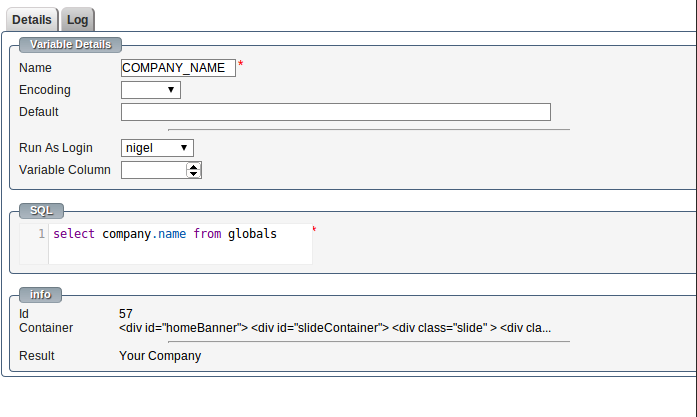 The designer can show or hide any component on a page based on the browser form type. Once the site is marked as a "Progressive Web App" a new tab will be displayed "Manifest". This allows the developer to change the default values. 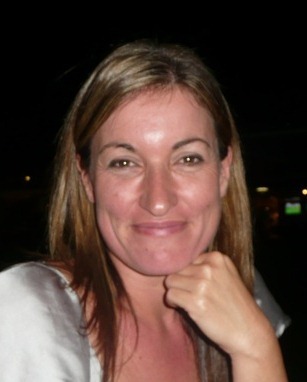 There is a lot of fuss nowadays about search engine optimisation (SEO). Apart from sounding cool and highly complex what is SEO? Well to tell you the truth it is quite simple in fact. 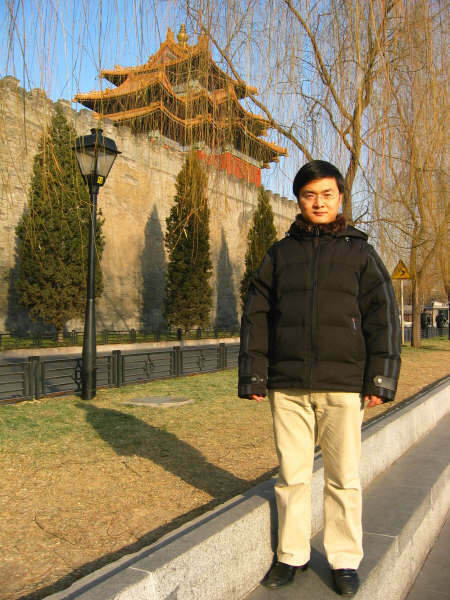 Lets start with the first part "search engine". Most obvious examples of these are Google Search, Yahoo, Microsoft Bing, Yandex and many others. Search engines are in fact web applications that contain information about your site and hence when a user searches for some keywords or phases the search engine can match those against information it has to provide the web user with a link to your site. This gradually brings us to the second part - "optimisation". Optimisation is adaptation of your site to the way a particular search engine works. This therefore increases the chances of correctly matching keywords to pages of your web site and places your website higher on the pages of search results. Luckily most of the Search Engines look for clues described by best practices of HTML. Proper URL. This is one of the most important things that search engines look for. Do not put codes or strange parameter values. The more human readable the URL is - the better. 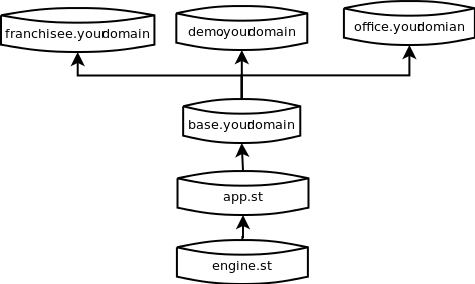 A good example for a product page would be: http :// yourdomain.com/category-name/product-name-and-code.html. The more valuable keywords (such as category and product names) the URL has - the more likely it is to have a better scoring value when indexed by search engines. Giving a good title to your pages. If you have a hierarchy such as category, sub category and then particular product page - then this should come in reverse order: [product name and maybe code] - [sub category] - [category] - [your site domain]. Have good keywords and descriptions. Although this topic is quite controversial it is misuse of these attributes by many sites which has many search engines starting to ignore keywords and descriptions. However one thing to point out is that description usually appears in search engine's results - so make it a good one to attract your target audience. This list is far from being exhaustive but the points above represent the main things that must be done correctly before anything else is attempted. Anything beyond this in fact would be search engine specific implementations and hence are beyond the scope of this article. Pages can have any number of aliases. When a page's path is renamed the system will automatically add an alias from the page's previous path to the current page. This prevents 404 errors which are a well known cause of user frustration and lower SEO rankings. When a user requests a URL first a matching page is searched then the page aliases are searched, if a matching page alias is found then that page is used. There are NO 301/302 errors returned there is just many paths to the same page. Search engines treat hyphens '-' and underscores '_' differently from one another. Google has clearly stated that when it comes to URL structure, using hyphens rather than underscores makes it much easier for them to identify what the page is about. Take a look at an excerpt below from the Google support blog on URL structure. All published articles are avaiable via the RSS feed automatically. When articles are published the built in social integration automatically posts the article to the requested social sites. When posting to twitter the title and subtitle are automatically shorten to within the 140 character limit. All published articles are automatically published via the RSS feed. The CMS automatically generates an XML Sitemap which can be submitted to search engines for faster indexing of new content. To set up Google Analytics tracking of your web site. Log into you Google Analytics account. All standard templates will automatically create the Google tracking script when a tracking ID is entered and not in design mode. 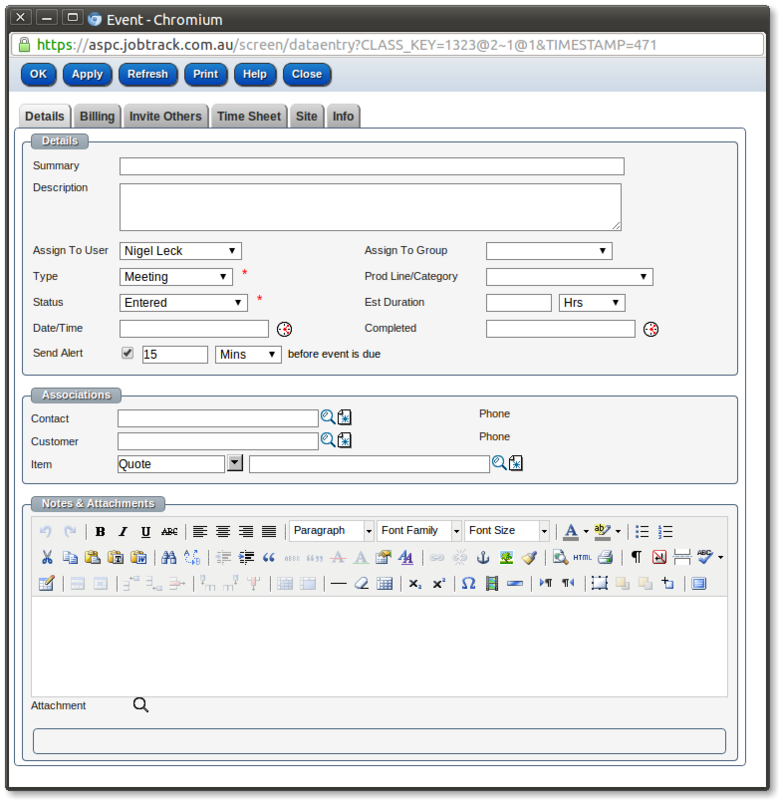 Every form in the system is created with the form painter and can be easily customized to suite the changing needs of the system. Unique layered database structure allows content and customization to be shared across systems. stSoftware systems are built from the ground up on a unique multi-layered database structure which allows documents, articles, business rules and all other types of data to be selectively and securely shared across many systems and sites. A layered database system is the aggregation of the layers below by selectively placing data and documents in different layers they can be securely shared across the different systems. 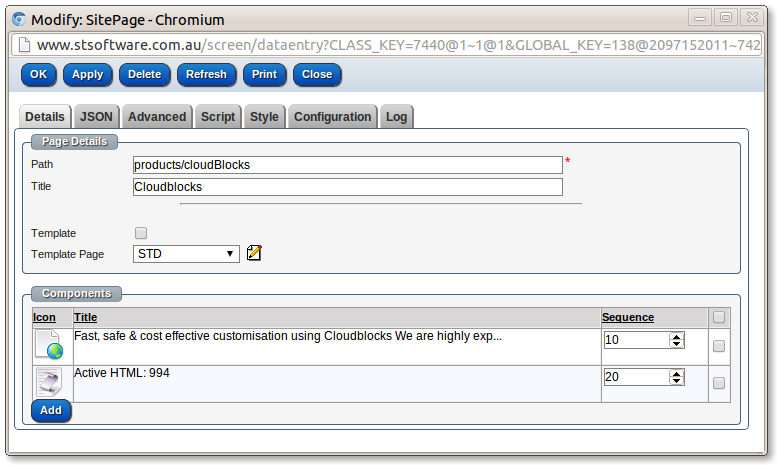 The data model allows for many standard field types to be added to any class. There can be simple keyword or complex form base searches. 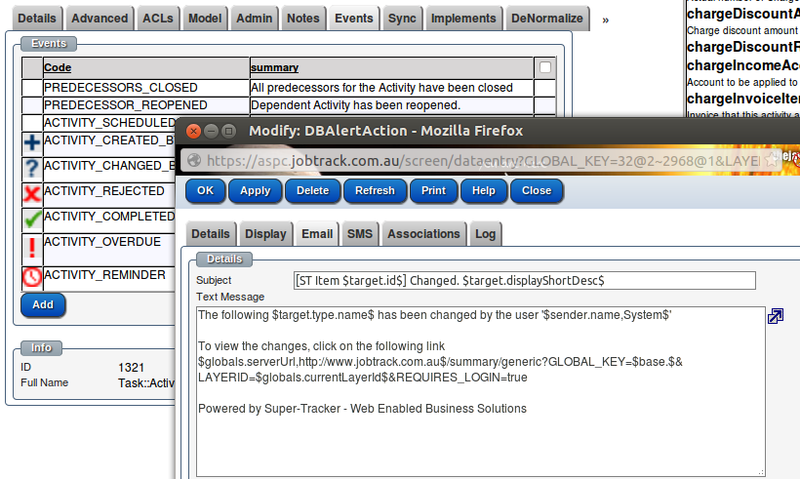 Events and actions can be defined on any class in the system including Articles and Pages. Every user has their own login/password/access levels. 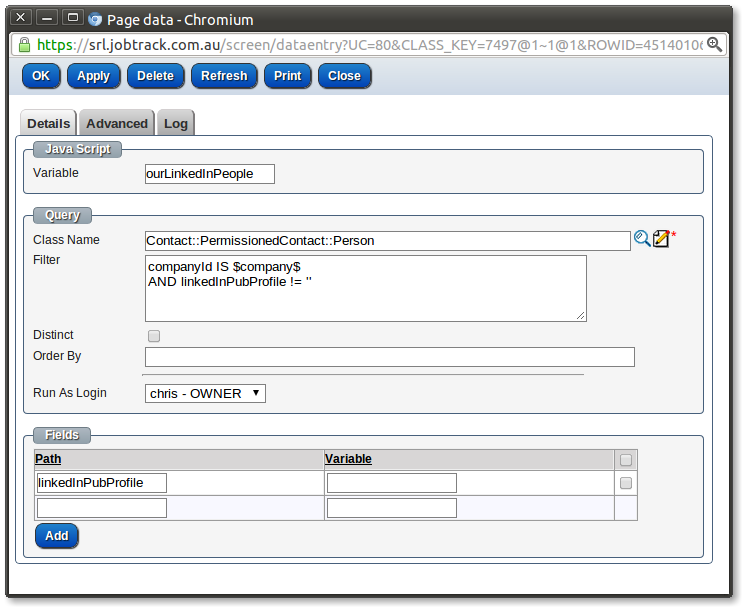 The system requires every user to have a unique login and indeed can be configured to logout other sessions when the user logs in via another browser.